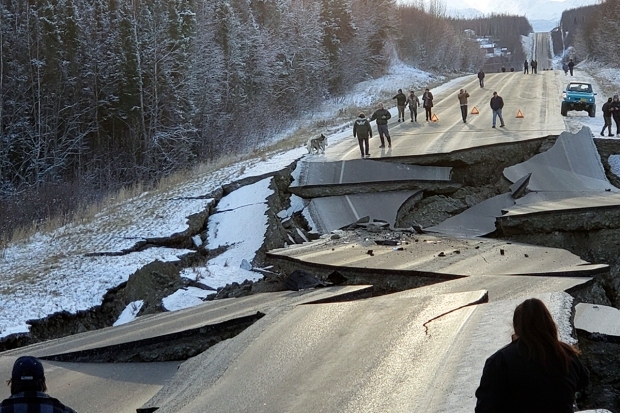 The quake was centered about 7 miles (12 kilometers) north of Anchorage, which has a population of about 300,000. People ran from their offices or took cover under desks. A 5.7 aftershock arrived within minutes, followed by a series of smaller quakes. The 800-mile (1,287-kilometer) trans Alaska oil pipeline was shut down for hours while crews were sent to inspect it for damage. Michelle Egan with Alyeska Pipeline Service Co., the pipeline operator, said the line was restarted at 3:30 p.m. Friday. She said there are no obvious signs of damage and no operational impact on the pipeline, whose closest section is 120 miles (193 kilometers) from the epicenter. Alaska's 1964 earthquake, with a 9.2 magnitude, was centered about 75 miles (120 kilometers) east of Anchorage. It and the tsunami it triggered claimed about 130 lives. Associated Press writers Becky Bohrer, Dan Joling, Gillian Flaccus, Gene Johnson, Jennifer Kelleher, Audrey McAvoy, Caleb Jones, Rachel La Corte and John Antczak contributed to this report.